Updated 9.00am. Live updates for Saturday are now here. It looks like there will be no trains through Ludlow today (Saturday). You can expect the same on Sunday. On Monday, trains are expected to be “highly impacted” first thing in the morning. Other than a few bus services last Wednesday, there have been no replacement buses and none are yet announced for today. Arriva Trains Wales has announced at 8.45am the routes it is running today. The list doesn’t include trains through Ludlow on the Manchester to Cardiff line. Arriva Train Wales is advising “Do not travel”. Arriva hasn’t updated its information overnight. livedepartureboards.co.uk seems to be the most informative website for trains at the moment. 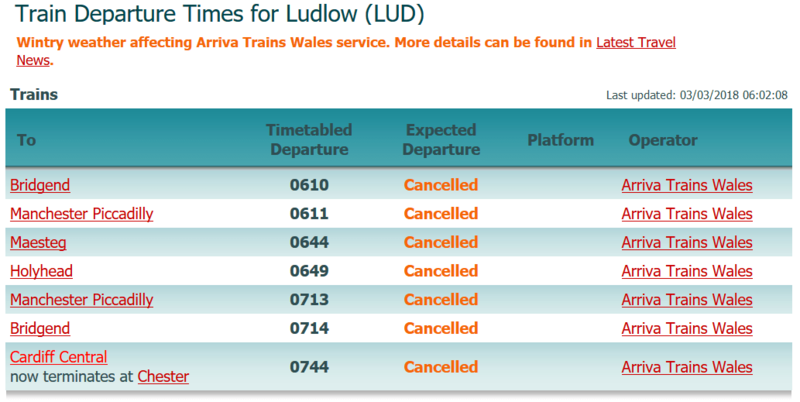 It shows no trains through Ludlow this morning. Arriva have yet to provide information on replacement buses. Arriva Train Wales is facing two problems: the inclement weather and damaged rolling stock. Arriva are talking lots about the weather. It seems to have taken a vow of silence on the fitness of its train fleet after damage was identified overnight on Tuesday. Perhaps this has been resolved. If so, why hasn’t the company told us? If the damage to wheels is not fixed, and it was reported at one point to have affected the entire fleet of Class 175 trains, we are not going to see resumption of a full service any time soon. We need to know that so that people know what to expect and can make alternative arrangements for next week. One thing our local railway services are not doing well is telling people what is really going on. As late as 8pm last night, Arriva was saying it didn’t know whether trains would run today. It was still directing people to websites with out of date messages at 9am on Saturday. We are also facing a problem with different information on different websites. Some sites have not been updated since 3pm yesterday. Arriva Train Wales will not resume its Twitter feed until 8am this morning, quite late in the day for many travellers. Whether this current disruption is due to unprecedented circumstances, the combination of wheel damage and severe weather, the company is not saying. The weather is very bad but not unprecedented. We don’t have any information at all on the wheel damage. Arriva Train Wales doesn’t seem to have any contingency plans – or replacement buses. It is very hard for workers, students and hospital patients to plan for Monday. It would be good, given the improving weather, if the company announced limited service for Monday so those who really do need to travel can do so. Meanwhile, the drip feed of uncertain information from Arriva is not helpful. It would be better if the company announced there will no trains on our line through the weekend. Then at least people will know where they stand. 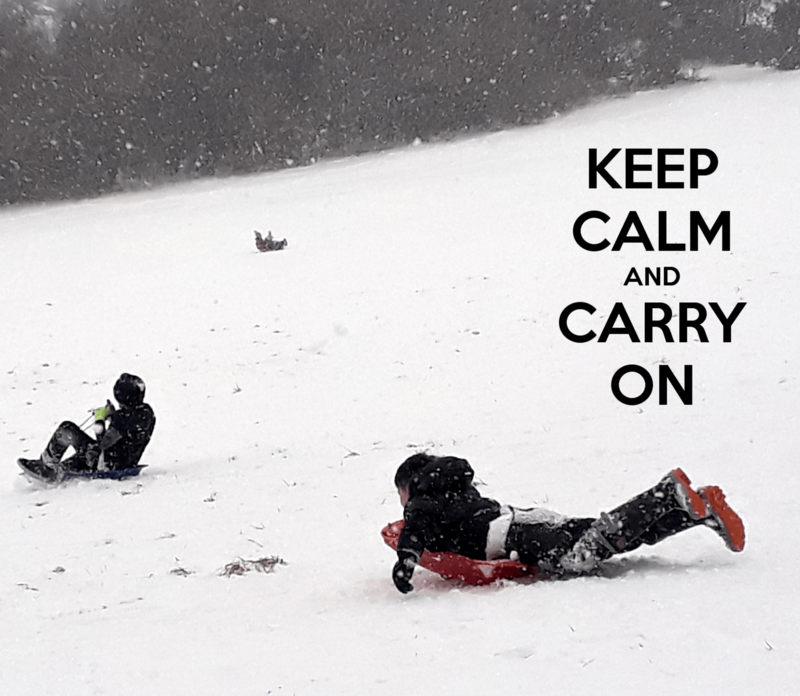 Meanwhile, why not enjoy the snow! How can you expect a gang of foreign mercenaries (in this case Deutsche Bahn) to give two hoots about running a service hundreds of miles from their home base in Berlin (I bet the trains are running there, despite deeper cold and snow!) or anyone else for that matter. Nothing exemplifies the moral and financial bankruptcy of privatisation policies in this country over the past thirty years more than disaster of the public transport system. It’s all right to have a nationalised company running our trains it seems as long as the country in question is not the UK. I well remember snowier colder winters than this in Shropshire in the sixties when I never once missed my train to school because of cancellations! A farce, a shambles, a joke and a tragedy all rolled into one, as per usual for UK PLC. Jonathan’s comment says it all. ATW’s behaviour on this occation is a disgrace even by its own abysmal standards. Oddly, I did see a train yesterday afternoon go through Ludlow, I think-the regular flash of turquoise-from my house. It surely couldn’t have been a goods vehicle because of the colour? I wonder what that was? And yes it is a disgrace and really it shouldn’t be necessary. Is it an urban myth or a truth? Network Rail pay less in compensation for rail cancellations than ‘service providers’ have to pay passengers if they cancel less than an hour before departure. It is a recipe for risk aversion on a spectacular scale. I am not convinced by the coincidence of dodgy wheels and the Beast from the East.